It has been a while since I have been Jeeping in Moab, so I didn’t miss a beat when selecting trails for today. By the end of the day, Andy and I will have run three of Moab’s most iconic trails: Gold Bar Rim, Golden Spike, and (most of) Poison Spider. This review covers the first trail: Gold Bar Rim. The day started with a brisk temp and a stiff wind which kept temperatures pretty mild even though the sun was beating down on us all day. Gemini Bridges road leading up out of Moab. Click to enlarge. 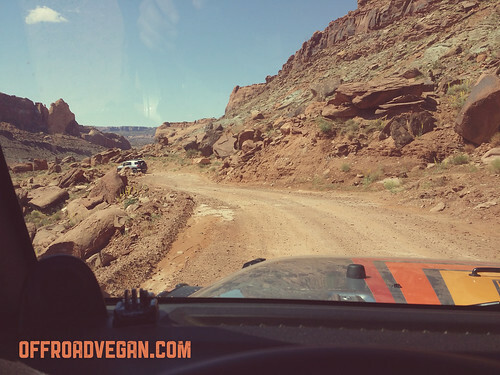 Heading ten miles North out of Moab, we turned onto the road for Gemini Bridges. This shelf road quickly climbs for some sweet views below. Eventually it levels off in a pretty wide canyon with some nice campsites peppered throughout.